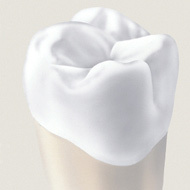 A crown is a cover or "cap" your dentist can put over a tooth. 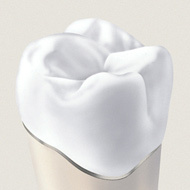 The crown restores the tooth to its normal shape, size, and function. 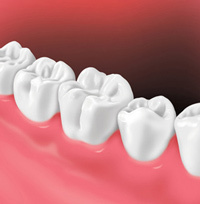 A crown can make the tooth stronger or improve the way it looks. 4. 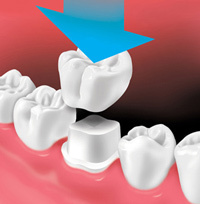 When the new crown is ready, the dentist places it in your mouth and makes the necessary adjustments. When you and your dentist are happy with how it looks and feels, the crown is cemented into place. • Brush your teeth twice a day and clean between your teeth once a day. Look for oral care products that have the American Dental Association's Seal of Acceptance, which tells you that they meet ADA standards for safety and effectiveness. 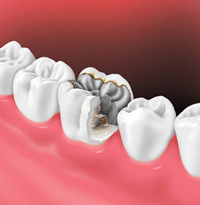 • Avoid chewing hard foods, ice, or other hard objects, such as pencils, especially if you have tooth-colored crowns. Produced in cooperation with the American College of Prosthodontists "Crown Used to Replace a Filling" - photos courtesy of John R. Nosti, DMD, FAGD, FACE, www.cosmeticdentistryofsj.com.